While I am away doing a volunter IT system admin job in Israel, I have a small computer back in the UK I use a server. Its a little Dell Optiplex SX280, its a ultra small form factor PC about the size of a large telephone book. 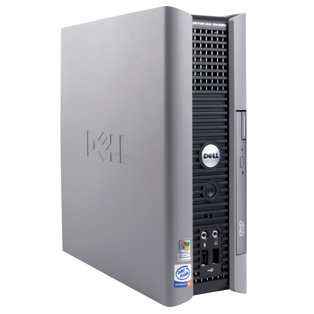 I used to support these type of PCs in a hospital I worked at, and I decided to get one for myself to use as a server. I paid about £75 for it off ebay which the seller promised it had a Pentium 4 2.8 processor, so I was quite pleased when it arrived with a 3.2 processor 🙂 I added 2.5Gb of memory and a 320Gb hard disk, which uses normal off the shelf bits. The performance of the PC is good but I would recommend vacuuming out dust from the insides which can block up the fans once in a while. This mini server is perfect for me, although it doesn’t have any slots, and can only support one hard disk. I use this computer in conjunction with VNC and RDP using a Dynamic DNS address my brother in law Jim helped me set up along with the right setting in a now very obsolete B series Netgear wireless router. In more recent times I just use Logmein which is easier and less fiddly to set up. These days I prefer small quiet computers. I used to work at Novatech a computer dealer just outside of Portsmouth and since then I have lost interest in self-build/clone PCs which turn out to be more trouble than they are worth in their reliability and quality, having mostly Asus based clone PCs at my work, I spend a lot of time replacing failing hardware. 1. I run virtual machines on it using Windows XP as a base operating systems and simulate multiple extra computers and used it to learn a lot about Windows 7 which it runs beautifully under Sun/Oracle’s Virtualbox. 2. I use this box for downloading TV shows from BBC iPlayer using a special alternative app that downloads them as MP4 files, as this cannot be done on a non-UK IP address, so I can get TV shows remotely and copy them into Dropbox and watch them on my laptop here in Jerusalem. 3. I also do web based surveys which earn me a small amount of Amazon vouchers, this only works in the UK. 4. When I eventually head back to the UK I can stream TV shows off to it, althoughnI am one of these odd people who still has an old fashioned CRT telly, so will look at to treat myself to a LCD TV when I am one day back in the regular workplace again. As an IT person its important not to stop learning new things, and I am wondering what my fellow peers in IT do to use as a lab for trying out stuff. However in recent times for my work I need to learn more server environments like Windows Server 2003 and 2008, the latter version is mostly used in 64 bit form, also VMware which is the most popular software system for running virtualisation set ups, so I now need a 64 bit based system as a server. 1. They are small form factor, can sit in a shelf or a cupboard out of the way, only uses 40-70 watts of power, means more time on a UPS power back up system, quiet running fans. 2. Really cheap, about £140, actually £240 but you get £100 back from a rebate from HP. A real server for the price of a simple NAS device. 3. Have chassis to support 8Gb of RAM (2x 4Gb) and 4 hard disks in a RAID array. A few limitations on this device is, relatively low powered 1.3 AMD CPU (but is 64 bit) only 1Gb of RAM and single 250Gb hard disk (just to get you going, you will need to upgrade) no optical drive, you can get a DVD writer for £12.50 (I got from Amazon free shipping!) anyway or install Windows or Linux from a USB stick. Just a blank drive for your preferred operating system. The low spec of the server is intended for businesses with less than 10 people. So the plan is, when I am next in the UK, is to get one of these HP microservers and put it in place of the Dell, run VMware ESX and similar and run a XP virtual machine and various other environments for myself, questions I have, is VMware easy for me as administrator to control from a long distance without anything going wrong that needs someone nearby? I am going to a VMware conference in Tel Aviv this week. Also, two of these would be great for a project at my work as I need to run a critical database system in a remote location, instead of the traditional server having two power supplies and two hard disks in case of one failing, having two relatively cheap servers running parallel with data mirrored on both of them, this in my opinion seems like better performance and redundancy for the money it seems. 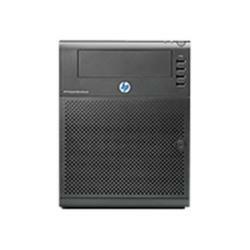 I think HP will sell loads of these units, I would love to see if any other IT pros have bought for them for their own test environments, or even if two or more given their bargain price could be used to run a critical system needing redundancy or fail over of some sort. Some people are running Microsoft’s Windows Home Server (WHS) on these, this seems fine but I would rather use an enterprise grade server like Ubuntu or Server 2008, or just stick to a NAS to store videos and music on. Microsoft have free 90 day trial versions of Windows 7 and 180 day version of Server 2008 to test out which I want to play around with more.